or see the maps in the back of most good "Study Bibles." Since borders frequently shifted, there are some differences between the political geography at the time of the birth of Jesus (ca. 4 BCE), the death of Jesus (ca. 30 CE), the ministry of Paul (ca. 40-64 CE), and the writing of the other NT books (ca. 70-100 CE). The names of the ROMAN PROVINCES (or other significant regions) are in bold capital letters below; their first-century capital cities are in bold italics; other important cities and towns are in small bold print. 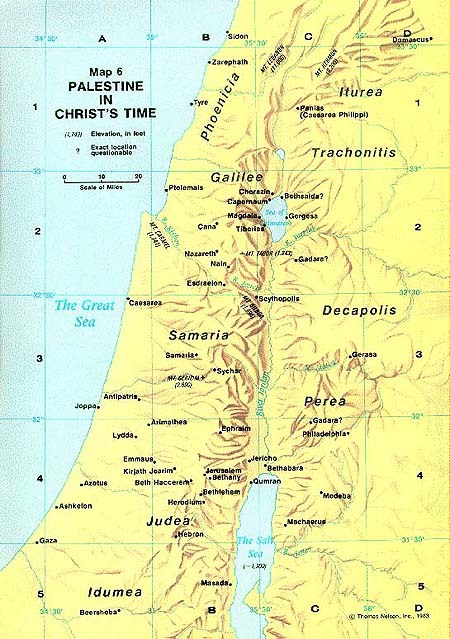 locations in/near Jerusalem, especially in John's Gospel: Pool of Bethesda, Pool of Siloam, Praetorium of Pilate, House of Caiaphas, Gethsemane, Kidron Valley, Golgotha, etc. The other cities are not mentioned individually in the NT, aside from an exorcism in the "region of the Gadarenes" (Matt 8:28) or the "region of the Gerasenes" (Mark 5:1; Luke 8:26,37).